Orion-Opus is a square supply diffuser for installation in modular ceiling systems. The unit offers excellent induction, and is suitable for both constant and variable air flow rates. Orion-Opus features a removable front panel with Opus nozzles, and is available with 4 different nozzle settings: rotational, 1-way, 2-way 180º or 2-way 90º. Please see order code and fig.3. 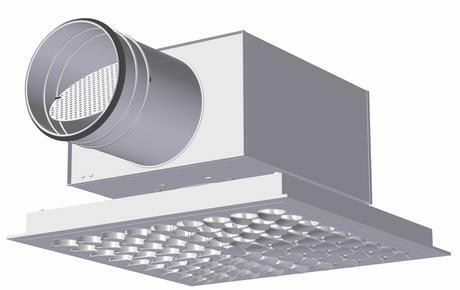 Furthermore, the unit is equipped with a TA flange suitable for T-profile ceiling systems, but is also available with alternative flange designs, type: DC, DG, DS and EK (see fig. 2 and order code). The diffusor front can be supplied with integrated motion sensor. The Luna plenum box is recommended for improved sound attenuation, and works as an adjustment and measurement unit. Luna is a rectangular box fitted with a removable damper which provides access to the connecting duct. The damper can be secured in any position required. Luna plenum box features a damper and measuring outlet for commissioning. It is insulated with a sound absorber in polyester and is available with one or two dimensional changes between inlet and outlet. Furthermore, the box can be delivered with external condensation insulation. A low-profile design [UI] is also available, and for this type a reduction in capacity of approx. 20% will apply. The distance between valve and box can be increased by up to 35 cm without extending the wire and measuring tube. The front panel, ceiling plate and valve body are in a steel design, and the connection collar is fitted with an EPDM rubber gasket.Opus nozzles at the front and corner connection points are in plastic. Connection points are fitted with holding magnets. All internal and external valve elements are in a RAL 9003 - gloss 30 finish. Other colours are available on request. Luna is supplied in a galvanised finish, and with all four internal walls lined with sound absorber in polyester. Equipped with EPDM rubber gasket on connection collar. Orion-Opus can be installed in a range of modular ceiling systems as well as in fixed ceilings, see fig. 7. If a Luna plenum box is used, the unit is attached to the rear of the support bracket by means of threaded rod or strap (fig. 8).